The Dark Brotherhood is a guild of professional assassins which historically possessed considerable influence and power but has recently fallen on considerably harder times. 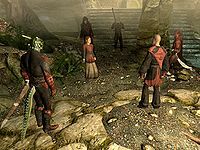 It is similar to Morrowind's Morag Tong, but despite a common misconception, it is a completely separate organization; also, the legality of this organization is much more limited than that of its older cousin. The leader of the Dark Brotherhood was the Night Mother, but now that role has fallen to Astrid. The Dark Brotherhood also has a contact in the Riften Thieves Guild. In Skyrim, you can choose to either join the Dark Brotherhood and take on assassinations for hire, or destroy the Brotherhood's last remaining chapter. Joining the Dark Brotherhood requires you to first complete the quest Innocence Lost. You can start that quest by overhearing a rumor that Aventus Aretino is performing a ritual called the Black Sacrament, speaking to Aventus yourself, or by talking to the orphans of Honorhall Orphanage in Riften about Aventus Aretino. To destroy the Dark Brotherhood, kill Astrid instead of a hostage when you arrive in the shack during the quest With Friends Like These... You will then fail that quest, and the quest Destroy the Dark Brotherhood! will appear in its place. This will be your only opportunity to attack the Dark Brotherhood. Free access to the Sanctuary, although it can also be accessed while destroying the Dark Brotherhood. Inside the Sanctuary is a word wall for the Dragon Shout Marked for Death and an Unusual Gem. 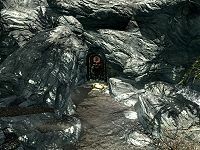 Access to the Dawnstar Sanctuary, which has some useful items when upgraded, also becomes available near the end of the questline. This includes Dark Brotherhood Initiates, who cannot be killed, and a space with attributes similar to a house. You receive your own set of shrouded armor, which boosts several of the skills most useful to an assassin. The only other source of this armor is named Dark Brotherhood members. You may obtain shrouded robes, shoes, hood, and hand wraps, which yield no armor rating but have other enchantments useful to assassins. Ancient Shrouded Armor is also attainable by completing optional questlines. The Blade of Woe, a dagger with higher base damage than all other daggers except the dragonbone dagger(DG), which has the same base damage. Windshear, a unique scimitar with a powerful stagger effect. The unique horse Shadowmere, which has the highest health and stamina of any horse available to you. The Summon Spectral Assassin power. All Dark Brotherhood members are friendly to blood-starved vampires (stage 4), and can be fed upon. This is no longer a unique benefit if the Dawnguard add-on is installed. Access to Babette, the Master Trainer for Alchemy, and Nazir, the Master Trainer for Light Armor. The primary Dark Brotherhood questline consists of fourteen quests. Three achievements (50 points; 2 Bronze and 1 Silver) are unlocked by the guild's quests. Honor Thy Family: Regain the trust of your fellow Assassins. These are miscellaneous quests (each quest's objective is listed in the "Miscellaneous" section of your journal) and will only activate if certain conditions are met. There is a radiant dialogue system for the Dark Brotherhood members. The conversation starts with a random line from one participant. This is followed with a random line in response, and a further random question by the first speaker. The final line is still randomly selected, but each member of the Brotherhood has a choice of three unique lines and two generic lines to finish with. Some members have more than three unique lines, but they can only use three depending on the second participant. Other members in the vicinity may chip in with random generic phrases depending on the stage of the conversation. Anyone "So, is it true?" "I heard about what happened..."
"Tell me, brother/sister. Are the stories true?" "Your latest exploit certainly has the Sanctuary talking..."
"Come now. What everyone else is saying. It can't possibly be true..."
Astrid to Arnbjorn* "Tell me, husband. Is it true what I've heard?" Arnbjorn to Astrid* "Astrid, I've been hearing some, er... interesting things, from the others... about what you did when you left the Sanctuary last week..."
Anyone "You're referring to that blacksmith contract?" "You must be talking about the caravan job..."
"Word certainly travels fast, doesn't it?" "The temple contract? Well, I certainly won't deny my involvement. He he he he he." "The Redoran contract? Yes, you heard correctly. In and out of Vvardenfell in less than forty eight hours." "Ah, you must mean my little adventure on the ship..."
"Oh, you mean in that manor house? During the thunderstorm? Heh. What can I say? It happened, just like you heard." Anyone "But to be outnumbered twenty to one..."
"You infiltrated the position, eliminated the target, and made it look like an accident. Impressive. I'd say you earned your bonus on that one!" "To kill triplets, secretly, and then have the whole thing blamed on the mother. Remarkable." "By Sithis, you slew everyone! Well, except for that one you kept alive, to serve as witness. Does your wickedness, or your skill, know no bounds?" "But really. A horker, some twine, three wood elves, and a hatchet? Points for creativity, if nothing else." "It's the part with the severed head I find most impressive. My compliments." "I'm just trying to imagine you hiding inside the body of a mammoth. Bloody brilliant idea." Anyone but Astrid "It was a suicide mission! Astrid said as much. Yet here you stand, hale and hearty." Nazir "It's all thanks to a special technique I developed. I call it the "Razor-Winged Butterfly." I'd teach it to you... but then I'd have to kill you." "Yeah, well, don't expect many more stories like that in my future. I'm getting old. Being that amazing takes too much damn effort." "Hmph. Been awhile since I've actually cleaved someone in two. Forgot how hard it was to get the scimitar back out." Festus Krex "Let that be a lesson to you young pups. There is no challenge that magic cannot overcome." "Bah! A child could have accomplished it. Such is the power of the arcane. If you only knew of the spells I didn't use. He he he he he." "What? You think me too old, too feeble? There is more knowledge in me than in two of you pups put together. And knowledge... knowledge is my weapon." Arnbjorn (not talking to Astrid)* "Once again, you have underestimated me. You see the man, brutish and hulking. But I am wolf as well. Deliberate. Cunning." Only between Arnbjorn and Astrid* "Romantic, isn't? Like that time we first met. Remember that? Never seen so much blood. Ah, to be young again..."
Arnbjorn "When I am become wolf, I am treachery incarnate. And then, then... there is no one who can stand between the hunter and his prey." "When I first received the blessing of the wolf, my creator gave me a valuable piece of advice. "Arnbjorn," he said. "Never lose!" And I never do." Veezara "He he. Don't forget that I am Shadowscale. I was, quite literally, born to kill." "It was a simple matter, really, when one has mastered the art of camouflage. Scale becomes stone, becomes shadow. Then... death." "My greatest challenge was deciding which weapon to use, for I am prone to indecision. Bow, dagger... axe? In the end, I opted for my claws." Babette "In truth? It was so easy, I feel a bit guilty. Once again, the sweet, innocent child earned more trust than was wise." "You give me too much credit. For how could I fail? I am, after all, just a little girl. What threat could I possibly pose? He he he he he." "I am the perfect weapon. My innocent, childish form grants me nearly unrestricted access. Poison or a good bite usually takes care of the rest." Gabriella "I am but a humble instrument of Sithis. Our Dread Father guides me. Therefore, failure is an impossibility." "In the end, I relied on a woman's natural weapons - beauty and seduction. The rest was a formality. Though, a rather wet, messy formality..."
"When one can divine the future, success may not be assured... but it can at least be anticipated. It helps that I've already foretold my own death." Astrid talking to Arnbjorn* "Come now, dear husband. You above all people should know what I'm capable of." "Unscrupulous daring. It's why you fell in love with me, my dear." Astrid "Sometimes I just need to remind everyone why I'm the one in charge." "I guess I got tired of handing out contracts to everyone else, while I stayed home playing den mother. It was good to get out, and have some fun." "I'd be lying if I said I didn't enjoy myself. But more importantly, I made this Sanctuary some much needed gold. In the end, that's all that matters." Anyone "Well, I just did what had to be done. Nothing more. Nothing less. I'm just glad I lived to tell the tale." "Ah, contracts like that are few and far between, it seems. Makes me long for the old days..."
* These options are only available between these two NPCs, however they can still use other options when talking to each other. Joining the Brotherhood adds a few lines of NPC dialogue, like with other factions. Some guards will say "Psst, I know who you are.... Hail Sithis." Sometimes you may encounter a Dark Brotherhood assassin who carries a contract for your assassination as a random occurrence. This will only happen if you have not completed Innocence Lost. Contracts carried out by The Dark Brotherhood are illegal, unlike a Morag Tong writ. Therefore, it is vital that no one else sees you commit a murder while carrying out a mission in a city or settlement. Many targets have dialogue options which will provoke them, causing them to initiate combat with you. It is therefore advisable to try provoking targets before killing them to avoid incurring a bounty, especially if you are not particularly skilled at stealth. Most targets are located in such a spot that there will be a vantage point from which you can make a stealthy bow kill. If you have the Misdirection perk and pickpocket Astrid before joining the Brotherhood and steal the Blade of Woe, then pick up her Blade during the quest Death Incarnate, you can have two of these unique weapons. Esta página foi modificada pela última vez à(s) 12h53min de 12 de outubro de 2014.